Speaking at this years conference are Voddie Baucham, Sinclair Ferguson, Robert Godfrey, Steven Lawson, Albert Mohler, Stephen Nichols, R.C. Sproul Jr., R.C. Sproul, and Derek Thomas. These men consider some very difficult question as it relates to our contemporary culture. How are we to confront this present world? How do we live faithfully as godly remnant in such a world? How should we defend the faith? How do we stand up for and champion biblical ethics in a society that is hostile to our ethics? As has been true in every generation, the church today faces many challenges from the world. The intellectual and moral opposition that we face can seem overwhelming at times, which is why we need to remember that Christ has already overcome this opposition. By His life, death, and resurrection, our Savior has conquered our enemies, and by His Spirit He has granted us to share in the victory. The Lord, in His Spirit, comes alongside us to strengthen us for the battles we face. This strengthening occurs as we are grounded in His truth (John 17:17). 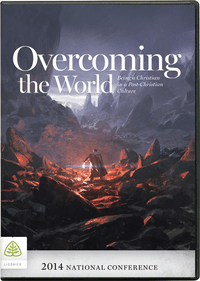 Ligonier is offering this years conference free for online viewing, it is also available for purchase.